Comm1.net provides a simple, effective, and low-cost text and emailing marketing solution that is sure to help you grow your business. So, how does one gather customer’s emails and/or text numbers to begin marketing? With Comm1.net, there are basically 3-Ways. This is by far the best solution for the customer signs up by either sending a text to your Comm1.net text number or sending an email to your Comm1.net email account. When the customer wants to discontinue receiving texts or emails, they simply text or email the remove phrase. What’s nice about this method is that there is no intervention on your part in maintaining the text and email customer lists. 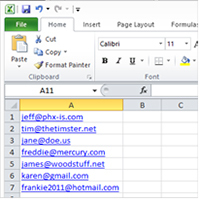 If you have a list of customer email addresses or text numbers, you can easily import the information into Comm1.net. You can either import your list into a one-off message or you can import your list into the contacts section which stores the information to use over and over. Recipients can be manually added to a message you’re creating for a one time use or they can be added to the contact section to be used over and over. © 2019 Phoenix Information Systems, LLC.